OK.. I am out on a limb . ACCESS g forecast. Troughing with an embedded tropical low just off the coast. We will be on the S /SW flank of the low with some weak ridging interfering at times. Should be a moist onshore flow. There is a NE infeed into the low which also connects to the coast for some of this time frame. Most of our area remains in the surface trough during this period. Synoptically speaking, the tropical low will be connected to our trough but the low will not come down south ( at least not this week or not at all). It migrates east along latitude 18s all week in the coral sea . No southerly transition yet from ACCESS. Here is a snap of the first day of our event with a precipitation signal on the trough line during diurnal max 2pm -onwards . ACCESS r suggesting some weakened activity may make it to the coast. 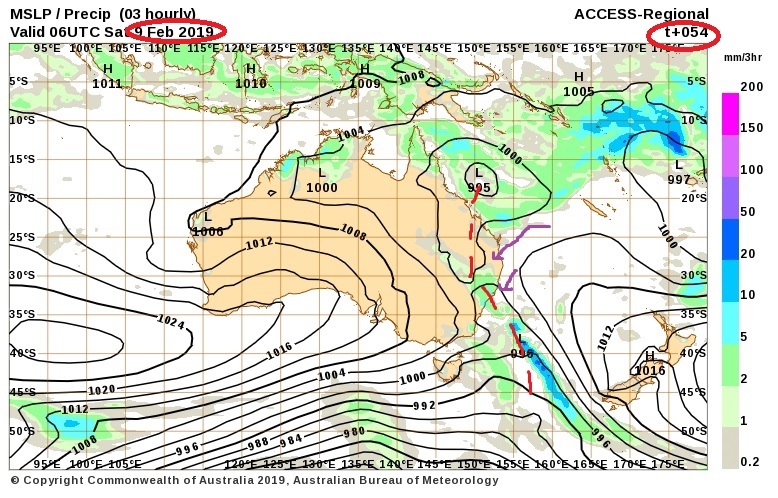 Good pick up Crikey, hopefully that low off the QLD coast doesnt block moisture flow from the Coral Sea. 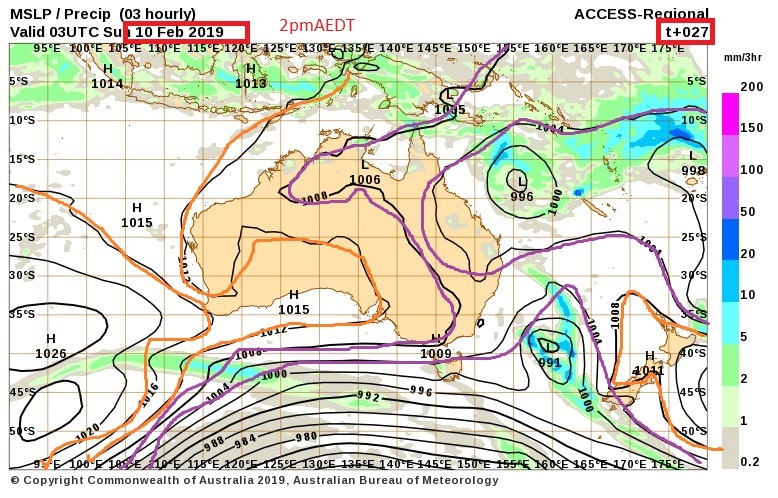 By 5pm ACCESS is showing some intensification and in fact the wet stuff makes it to the coast if you are south of ~ Brisbane.or south of the border perhaps. we will have westerly 500 hpa mid levels and sub tropical jetat 200hpa to encourage any wet activity over the ranges. Some surprise rain yesterday evening, with 3.8mm falling. Some thunder was heard, but the storms themselves mostly remained 10-15kms or more away from the coastline, and it was just their decayed remains that spread to the coast dropping some rain. Photo looking towards Smoky Mountain at South West Rocks yesterday before the rain. With the exception of lawns, it's otherwise remained surprisingly green despite only about 20mm falling since Christmas. Storms currently coming down the ranges, and heading E/ESE towards coastal parts. There also appears to be some speckles forming from that line and eastward to the coast. 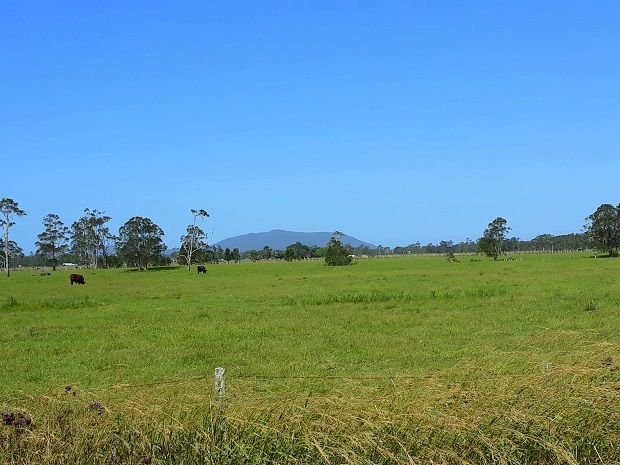 as l am typing another short line forming or just filling in' coffs' to west of Lismore. could be interesting. Unfortunately the Coffs Harbour Web cam is U/S as are a few others unfortunately. Synoptic pattern changing and on the move finally. The AAO has been highly positive during the stalled east coast ridging this summer. Here is tomorrows synoptic showing the change from yesterday. The Tasman high has shrunk and moved away .The east quadrant of OZ has lower pressure troughing. No rain signal of significance with this troughing tomorrow. Probably because the isobars are so far apart. There was fog at the tweed this morning. Maybe again tomorrow with no wind? High cloud building way to the SW. Too far away to get anything out of. Been a very warm sunny day. Not looking forward to 41C later in the week. Cheers everyone for their input. Bewdy that stinkin high goes into the graveyard ! Nothing stopping the one in the Bight or southern Indian replacing it? AccessG was dreamin again I see. Ahh, bit of action on 256K Stapy, havnt seen that for awhile. Thank you for starting this little thread. It's getting very hopeful around The Channon right now, where our paddocks are the worst they have been in over forty years. This storm front was largely unheralded on BOM etc, but was very well described here. Kudos. Radar looking good with a nice line of storms and showers from Oakey to Lismore. Most interesting it has looked for ages. AccessR has it pestering out to nothing around here though.When you look at the rada though you have to shake ya head.What . . The usual coastal capping storm shield again? Yes, just looked at that, wont get up this far though. I know! I just checked the radar and was dumbfounded, lets hope it makes the coast! Never gets worse in the dark , $100 on a fade out. 5 registered (snoopydoo, Homer, petethemoskeet, Kino, Knot), 73 Guests and 2 Spiders online.